"Peci" redirects here. For other uses, see Peci (disambiguation). Indonesian leader Sukarno and Malaysian leader Tunku Abdul Rahman wearing a peci/songkok. The songkok or peci or kopiah is a cap widely worn in Indonesia, Brunei, Malaysia, Singapore, the southern Philippines and southern Thailand, most commonly among Muslim males. It has the shape of a truncated cone, usually made of black or embroidered felt, cotton or velvet. It is also worn by males in formal occasions such as weddings and funerals or festive occasions such as the Eid ul-Fitr and Eid al-Adha holidays. In Indonesia, the peci is also associated with the nationalist secular movement. It is called "songkok" in the Ethnic Malay cultural sphere in Indonesian Archipelago. While in Java, it is called "kopiah" or "kopeah". It is also known widely in Indonesia as "peci", although peci has a more ellipse shape and sometimes decorated. The name "peci" was probably derived from the Dutch word petje means literary "small hat", or possibly derived from the Turkish fez instead. All names refer to the same object. Men of the Royal Malay Regiment (Rejimen Askar Melayu DiRaja) wearing songkok at bayonet practice, Singapore Island (1941). The origin of the songkok can be traced to the fez, which was adopted by the Ottomans in 1826 and subsequently spread to South Asia and to the Indonesian Archipelago (now part of Indonesia, Malaysia and Brunei). The songkok used to be worn during the Ottoman Empire and in some parts of Africa. One Brunei newspaper account erroneously states that the songkok became a norm in Malay Archipelago in the 13th century with the coming of Islam in the region. The earliest written mention of the word songkok is in Syair Siti Zubaidah (1840). While traditional triangular Malay headress of Tengkolok or destar is associated with traditional Malay nobles and royalties, songkok on the other hand has become part of traditional Malay men's costume associated with Islam, traditionally worn by local ulamas. The Royal Malay Regiment of the Malaysian Army have been using the songkok as part of their uniform since under British rule. Female version of peci with curved back, worn by Indonesian flag raising girls squad (Paskibra). Traditionally songkok are associated with Muslim men's cap. However, in Indonesia, the songkok has become the national headress with secular nationalist connotations made popular by Sukarno. Numbers of Indonesian nationalist movement activist in early 20th century wore peci such as Sukarno, Mohammad Hatta, and Agus Salim. 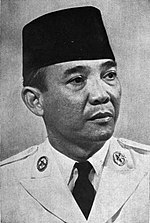 However, as the first president of Indonesia it was Sukarno that popularised peci — more precisely plain black velvet peci — as national men's cap of Indonesian, and Indonesian male presidents have worn peci as part of their official presidential attire ever since. Indonesian official palace guards also wore peci as part of their uniform. The Paskibraka (Indonesian: pasukan kibar bendera pusaka) or flag raising squad in Indonesian independence day ceremony also wear peci, and there is even female peci version with curved back. The Betawi people wear the Songkok as their traditional headdress usually colored dark red. In Malaysia, traditional male Malay attire consists of a songkok, shirt, matching pants, and waist wrap that is called a baju melayu. In a Dewan Undangan Negeri or in Dewan Rakyat, a member is required to wear the songkok to comply with the dress code of the assembly. In Singapore, the songkok is not allowed to be worn in government schools as part of the uniform as Singapore is officially a secular state and all religious headgear is not allowed to be worn. It is part of the standard uniform at madrasahs (Islamic religious schools). ^ a b Hendri F. Isnaeni (10 September 2010). "Nasionalisme Peci" (in Indonesian). Yahoo Indonesia News. Retrieved 10 September 2010. ^ a b c Rozan Yunos (23 September 2007). "The origin of the songkok or 'kopiah'". The Brunei Times. Archived from the original on 5 December 2008. Retrieved 13 April 2016. ^ Abdullah Mubarok (21 February 2016). "PDIP: Kopiah Bagian Dari identitas Nasional" (in Indonesian). Inilah.com. Archived from the original on 13 April 2016. Retrieved 13 April 2016. ^ Journal of the Society for Army Historical Research. Society for Army Historical Research. 1996. ^ Yusep Hendarsyah (28 April 2011). "Peci Hitam dan Identitas Paling Indonesia". Kompasiana. Archived from the original on 12 August 2012. Retrieved 28 March 2012. ^ Hubungan Etnik di Malaysia (in Malay). ITBM. 2011. pp. 127–. ISBN 978-983-068-579-3. Wikimedia Commons has media related to Songkok.